Something is up. Burger King just took soda out of kid’s meals. 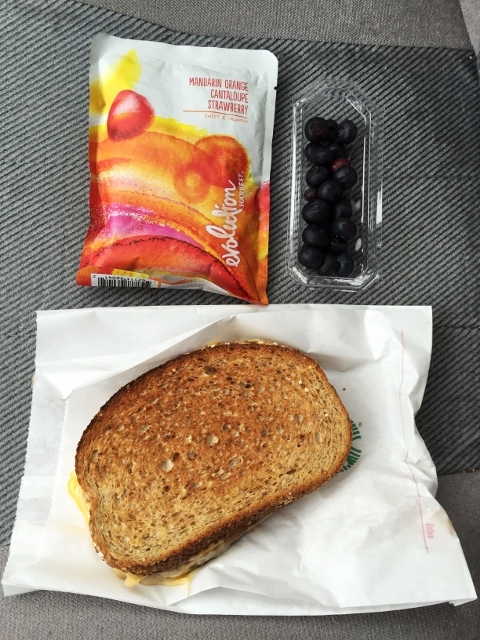 McDonald’s might add McKale to their menu and Subway is serving up two new vegan sandwiches. Apparently, Chipotle’s tofu sofritas were just the tip of the fast-food-can-be-sort-of-nutritious-while-also-convenient iceberg. But even with their well-intentioned nutrition upgrades, if you’re hungry (or hangry) and in a hurry, I believe you can do better than the BK or McD drive-thrus. Especially if you expand your definition to include “fast casual food” and you’re willing to pay a little more for better quality and fresher ingredients. According to The Chipotle Effect: Why America is Obsessed with Fast Casual Food you’ll pay $9-13 for this slightly upgraded meal-on-the-go vs. $5 at a traditional joint. And I am totally on board with that. As diets go, the Mediterranean diet has received a lot of praise for its health benefits and palatability over the long term. Zoës Kitchen has tried to make this style of eating convenient and available for the masses. Nutrition: They’ve put together a well-rounded plant-based menu full of Mediterranean staples like olives, spinach, tomatoes, cucumbers, garbanzo beans, lemon, capers, and feta cheese. They also have a generous selection of menu items under 500 calories. What They’re Doing Right: Offering sides like braised white beans, roasted vegetables, and seasonal fresh fruit. Are you kidding me? Clearly marking vegetarian, vegan, and gluten-free items on the menu for customers. 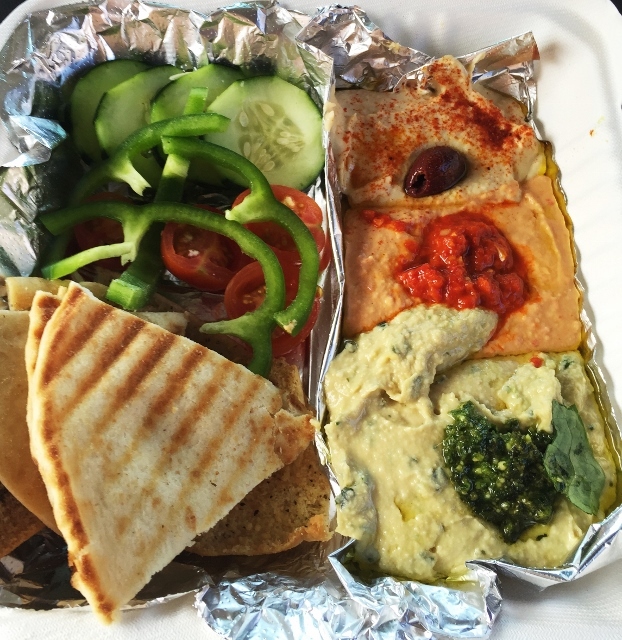 Location: Fifteen states in the southern and eastern U.S. including: AL, AZ, FL, GA, KY, LA, MD, NC, NJ, OK, PA, SC, TN, TX, and VA.
Hummus Trio: classic, red pepper and (crazy good) basil pesto hummus served with fresh veggies and pita bread. 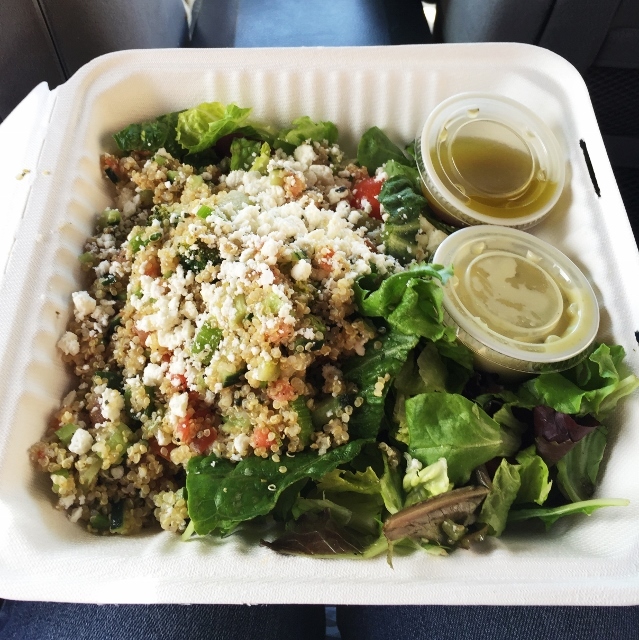 Quinoa Salad: quinoa, tomatoes, cucumber, celery, broccoli, green onion, olives, feta, and greens with a lemon vinaigrette. 5. Starbucks or your local coffee house. They started out with coffee, but they’ve now expanded to offer smoothies, tea, juices, sodas, and even food. Since many Starbucks have drive-thrus and they’re sort of what you’d call widely available, this coffee giant can be a speedy pit stop for other meals besides breakfast. Of course your local coffee house may be worth a second look as well. Many are upping their food game to try to compete with the national behemoth and get you to visit them again after 9:00 am. 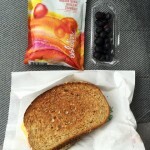 Nutrition: My sandwich was made with multigrain bread, which probably accounts for the 5 grams of fiber. And for a vegetarian option, it was super high in protein and calcium (hooray) but also sodium and fat (boo). Starbucks is very upfront with their nutrition information on menu boards, in their app, and on their website. What They’re Doing Right: Expanding their food menu with things like a Hearty Veggie and Brown Rice Salad Bowl, Roasted Tomato and Mozzarella Panini, and two meat-free Bistro Boxes that can be satisfying meals for vegetarians and non-vegetarians. My sandwich was really good. It was served piping hot right out of the toaster oven. So it’s not technically grilled, but more toasted/melted. Everyone likes pizza, but in the past your options were essentially dine-in or delivery. Take out is possible too as my husband and I can attest. Back in our college days, in a pinch we’d pick up a Pizza Hut pizza on the road and eat it in the car. Well, now there’s a better way. Spring-boarding off of Subway’s assembly line idea that lets the customer personalize their sandwich, MOD (Made On Demand) has a similar model for quick, easy pizza on the go. Nutrition: I was pretty excited to have garbanzo beans available as a topping to boost the fiber and protein in my meal. But beware the calorie-bomb they call a milkshake with 900+ calories. What They’re Doing Right: Offering a good tasting, thin and crackery crust with a little bit of chew, which cooks fast and has fewer calories than traditional or deep dish crust. Being open to special requests, even for vegans: the pizza dough is dairy-free, and so are the BBQ sauce and garlic rub, but there is cheese in the red and pesto sauces. And like Subway, putting vegetables on the menu: onions, spinach, artichoke hearts, peppers, mushrooms, arugula, and jalapenos. Load up on them; the price remains the same. Also, you can order online to make pick-up really handy. Location: AZ, CA, CO, IL, MD, OR, PA, TX, and lucky for me, 19 stores in WA. 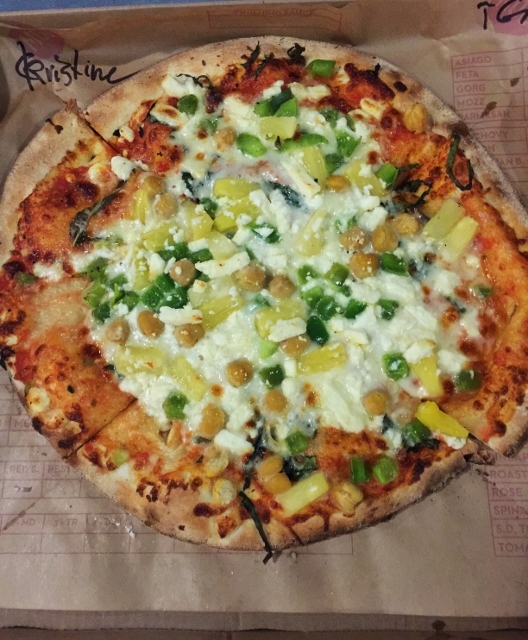 On my first visit I ordered this…the regular-sized MOD crust ($7.47). Before toppings it’s 480 calories. I’ve since wised up and now get the MOD Mini Crust with half the calories. 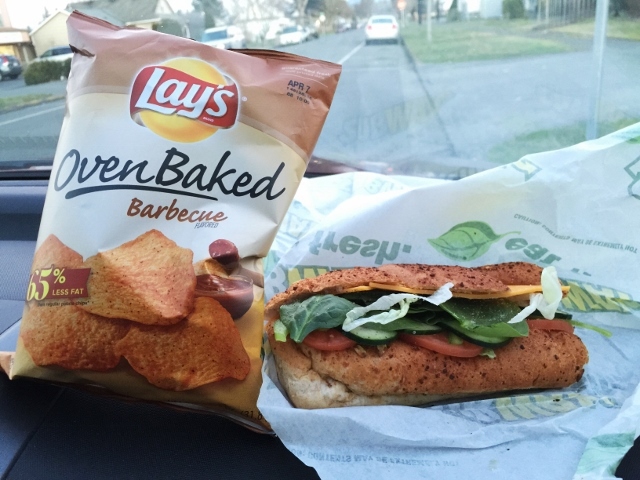 With their recent bread controversy put to rest, Subway remains one of the few fast food spots that puts vegetables front and center. The stores are easily accessible from almost anywhere, and sandwiches are universally familiar and crowd-pleasing choices for a group of friends or a family in need of quick nourishment. And because you get to build your own, everyone can be happy, including the meat free among us. Nutrition: Subway was one of the first food franchises to make their nutrition information available to consumers, which was really ahead of the curve. And now they have a handy “Calculate Yours” tool online that lets you figure out the nutrition facts for your particular (fussy, vegan, or sauce-laden) order. What They’re Doing Right: Offering sides like apple slices and “baked” potato chips, in addition to lowfat or fat-free sauces like light mayo, vinegar, mustard, and sweet onion. And for a little monounsaturated fat, which is hard to find in fast food restaurants, making avocado and olives available as toppings. Expanding their menu with two new vegan patties at select locations: Black Bean and Malibu Garden. Outstanding. Cost: $7.00 when ordered “as a meal”. Location: Their website notes 43,685 stores in 109 countries, so you shouldn’t have to look far. Veggie Grill is most definitely leading the way. They’re a fast casual restaurant that serves no meat, dairy, eggs, or other animal products. So they’re essentially vegan (they seem to prefer the terms “veggie positive” and “celebrate the vegetable” instead). But they provide comfort foods like Buffalo Wings, Mondo Nachos, Fish Tacos, and Crab Cakes. Seems like a formula for success. Nutrition: Look carefully at the nutrition facts – calories, fat, and sodium make a strong showing. 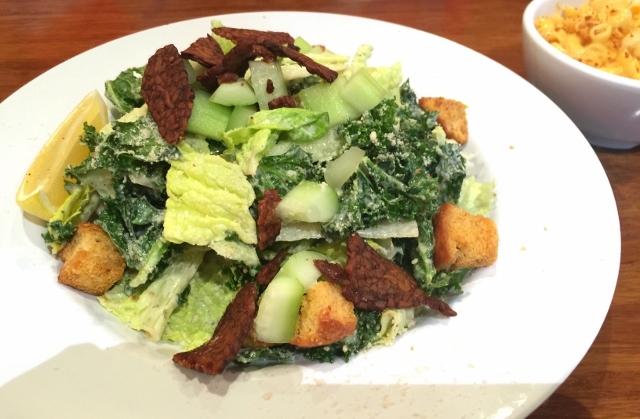 My medium-sized salad clocked in at 750 calories (if ordered as-is from the menu, which included avocado). On the plus side, you don’t need to worry about protein. Even though it’s vegan there is plenty of tofu, tempeh, Gardein Chickin’, Field Roast sausages, nuts, and seeds throughout the menu. What They’re Doing Right: I went with family, which meant meat-eaters and vegetarians dining in harmony. Everyone was happy with their meal, which seemed like a small miracle. My 10-year-old niece gave a big thumbs up to the Cauli-Mashed Potatoes and Gravy and said she would totally eat them again. And you’ll find millet, quinoa, brown rice, and buckwheat on the menu. It’s whole grain craziness. I’m pretty sure you’re not going to see that at KFC any time soon. Location: Currently only in CA, OR, and WA. 1. Whole Foods or your local natural foods store/food co-op. 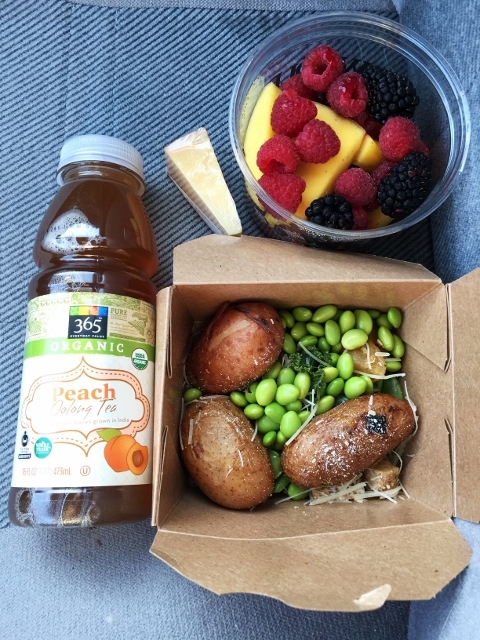 Besides exorbitantly priced groceries, Whole Foods also has a big selection of ready-to-eat foods including a salad bar, hot food bar, freshly baked pizza, deli items, and sandwich, burrito, and macaroni and cheese lines. And if you widen your perimeter a bit , you can pick up a nice variety of other foods to round out a meal. For example, in the specialty cheese section they sell tiny cheese niblets, individually wrapped, and just right for a side dish. Nutrition: It really depends on what you choose, but for the most part you’re going to be ahead of the curve. That is if you can walk past the homemade marshmallows and the gluten-free brownies in the bakery to the olive bar and grab-and-go salads. It’s most definitely a step up from the golden arches. And they can accommodate nearly any food allergy, intolerance, special diet, etc. That’s their gig. 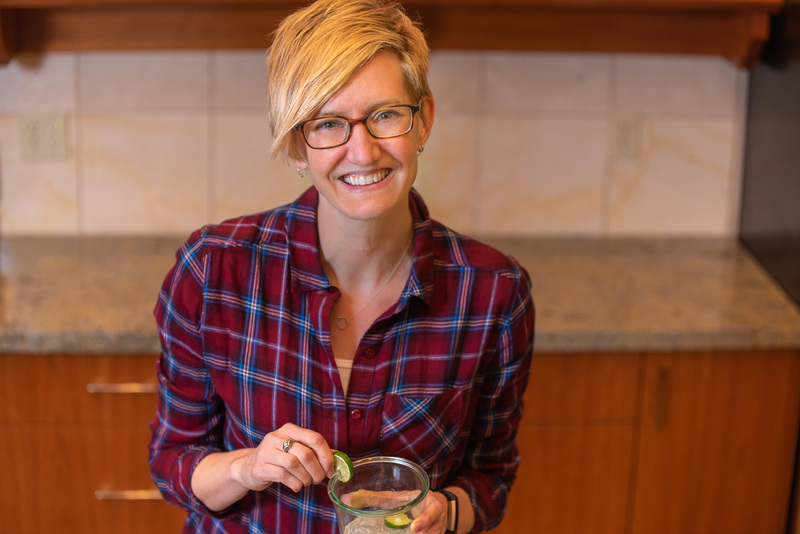 What They’re Doing Right: Continuing to lead the way in providing organic, seasonal groceries…but also cooking and/or pre-packaging some of those groceries for you so you can eat them on the go. Highlighting vegetables and fruits, and cooking up a massive number of vegetarian options and other unique dishes. You will be pleasantly overwhelmed with healthy options. Location: All over the damn place. Am I right? I wanted a hot meal, so I made a medley of foods from the salad and hot food bars, and then microwaved the whole mess on my way out of the store. This included cooked fingerling potatoes, cold edamame, cold tahini kale salad, beet and tofu salad with snap peas, and grated Parmesan cheese. I know, I know. Fast food isn’t good for you. But I think we can agree it’s getting better, partly because we’ve expanded the definition. “Food you can get and eat fast” has come a long way in the last few years. I’m definitely taking advantage of it and trying to support the innovators with my dining out dollars. Let’s hope the trend continues because like at no time in the past we have options. Fruity, veggy, beany, grainy, nutty, and yummy options. I’m sure I’ve missed some good spots that deserve a mention. What’s your tried and true meat-free mecca that gets you fed fast? Hi Kristine. Nice post! I’m wondering (after reading about your Starbucks grilled cheese) how you deal with the cheese enzyme issue? It seems that some vegetarians don’t know that many cheeses are made with animal enzymes. If the packaging, or the restaurant, doesn’t have the source info (ie; vegetarian source like microbial enzymes or vegetable rennet VS animal source like rennet which is derived from the stomach tissue of a slaughtered calf) it can be challenging to find out on the spot. Just curious if Starbucks was able to provide you with this info. Hi Sharon. Thanks so much for your comment. You bring up a good point. I’m careful with checking cheeses I use at home, but figured I can’t be sure when I’m eating out. I double-checked the ingredient list for the grilled cheese and it uses three kinds: mozzarella, cheddar and white cheddar. And the list only specifies “enzymes”. It doesn’t get any more specific than that. So, I just emailed the question about the source to Starbucks…we’ll see what they have to say. Hi again Sharon. Well, I emailed Starbucks Customer Relations to find out the answer to our cheese question. It took quite a while for a response, but they did get back to me and here is what they had to say: “The enzymes used in the cheese making process for these cheeses (there are 3 different cheeses used) are microbial enzymes, and they are from plant based sources.” Cool. Thanks so much for the update Kristine. I wish restaurants would just list enzyme sources as well as dough conditioners in their bread products (duck feathers, anyone? bleah!) for vegetarian customers. It’s why we just don’t eat out very much… sigh… thanks again for your reply! I really like World Wraps as an option if I’m anywhere near South Lake Union (I see they have a Bellevue store also). They have a few standard vegetarian menu items, all of which can easily be made vegan. Their dishes have (or can have) a surprisingly generous portion of good-quality vegetables in them, and you can get brown rice instead of white, and have the meal as a bowl rather than a wrap if you want to skip the white-flour tortilla. That’s so funny. When I first brainstormed places to visit and photograph for this post, World Wraps was on my list! I just never made it there. Thanks so much for the suggestion…Pita Pit is a great idea, too. Also, for less geographically limited options, I’ve had good luck at Pita Pit. It often seems to pop up in small towns just when I’ve list hope of finding decent vegan food! Chipotle is also my fave! I get the burrito bowl with sofritos, beans, corn, and guac. It is delish!! I also go to Pollo Tropical and get a veggie tropi chop with rice, beans, and corn and put their salsa all over it. Hi Bonnie. Thanks for the suggestion – I’ll have to keep my eyes out for Pollo Tropical!